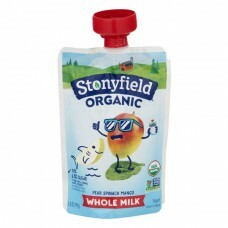 Stonyfield® Organic Whole Milk Yogurt Pear Spinach Mango. 35% less sugar. Than the leading kids' yogurt. See nutrition information for saturated fat content. USDA Organic. Non GMO Project Verified. nongmoproject.org. Yogurt. Vitamin D added. 3.5 oz (99g). 5 Live Active Cultures: S. thermophilus, l. bulgaricus, l. acidophilus, bifidus and l. paracasei. This product has 2.6g of sugar per oz vs. 4g per oz in the leading kids' yogurt. Made with a mission. No toxic persistent pesticides*. Live active cultures. Pasture raised. Cool tip! Freeze for on-the-go. *Our products are made without the use of toxic persistent pesticides. Grade A. Certified Gluten-Free®. Certified Organic by QAI. BPA-Free packaging. 1-800-PRO-COWS (776-2697). stonyfield.com. Keep refrigerated: Refrigerate after opening and consume within 24 hours. Children under 3 may have difficulty swallowing frozen yogurt. Please thaw before serving. Do not microwave. Do not refreeze after thawing.